The battery boom is coming to China, California and basically everywhere else—and it will be even bigger than previously thought. 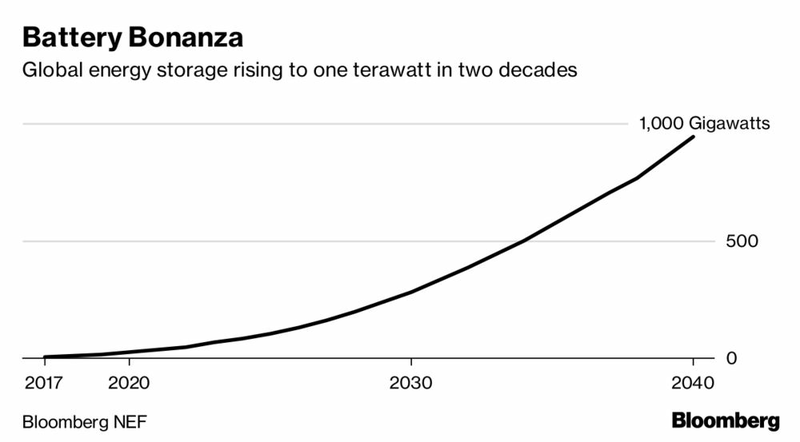 The global energy-storage market will surge to a cumulative 942 gigawatts by 2040, according to a new forecast from Bloomberg NEF published Tuesday, and that growth will necessitate $1.2 trillion in investment. Sharply falling battery costs is a key driver of the boom. BNEF sees the capital cost of a utility-scale lithium-ion storage system falling another 52 percent by 2030. But cost isn’t the only factor. Governments from China to California are spurring demand, as is the rise of electric vehicles and solar power. There’s also been a greater focus on storage for electric-vehicle charging as well as energy access in remote areas. The implications of cheaper batteries are far-reaching, upending multiple industries and helping spur technologies necessary to help fight climate change. Batteries power the electric vehicles that are popping up on our freeways. They also unlock solar power from the exclusive confines of the sun.